The activists of Freedom, Falcon, Action and the National Corps were fenced off from their opponents. About 70 representatives of nationalist forces at the Kulykove Field in Odesa attempted to engage in skirmishes and fights with the people who came to commemorate pro-Russian activists who tragically died in the 2 May, 2014 clashes with their opponents. In response, uniform-clad law enforcers lined up between the activists of nationalist parties and groups Freedom, Falcon, Action and the National Corps and their opponents, an LB.ua correspondent reported. At the same time, police have accelerated the access of the people to Kulykove Field and relaxed checking procedure. Previously, the police reported discovering a backpack with explosives in the area of Kulykove Field. The backpack was stuffed with hand grenades, petards, an electric detonator, WW II fuses, electric battery and TNT. 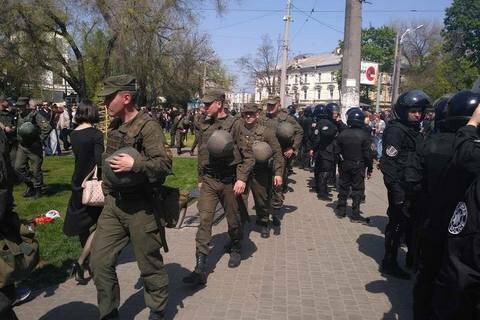 The territory of the Kulykove Field in Odesa downtown was closed for inspection by authorities, the national police website said late on 1 May. On 2 May, the access to the square Kanatna St. and from Italian Blvd. was allowed through two checkpoints, equipped with metal detectors. From 7 to 22 hours on 2 May, the movement of private transport is temporarily restricted in the central districts of the city adjacent to Kulykove Field, and Soborna and Hretska squares. Last year, the police found three grenades in an underground passage near the Odesa railway station not far from Kulykove Field. In the spring of 2014, Kulykove Field was a place of gathering and rallies of local separatists. On May 2, 2014, clashes broke out in the square between the supporters of the pro-European and pro-Russian political course of Ukraine. These clashes culminated in a large skirmish outside the Trade Unions House located on Kulykove Field. That building caught fire in unclear circumstances, resulting in the deaths of 42 pro-Russian and two pro-Ukrainian activists.